“My Neighbors” is finally released on the Apple APP store. This is the first release from POP and PALS . The game now works on ALL iOS devices! Joe at Fire Maple Games did the amazing programing. I hope you guys have fun meeting ” My Neighbors” ! Happy Summer Everyone. 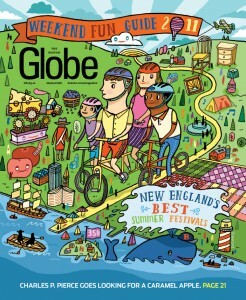 It was great doing another cover for the BOSTON GLOBE MAGAZINE . Thanks Globe! I wish NY had more tomato and quilt festivals like New England does ! Have a great summer everyone! Today is the Dear Japan Show in NYC to benefit the earthquake and nuclear crisis in Japan. There are 170 artists taking part in this amazing benefit. I have 4 framed prints in the show. Please come! For more info please see here.